The first badge of the Bureau of Investigation was issued shortly after the organization was established in 1908. In 1915, there were 219 agents who carried this badge as their only weapon against federal criminals, for they had not been authorized to carry firearms. 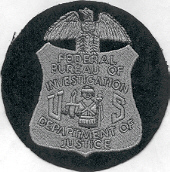 Shortly after J. Edgar Hoover was named director of the Bureau in 1924, the decision was made to adopt a new pattern for the Special Agent Badge. Many designs were considered, and the pattern of the miniature shield crested by an eagle was the final selection. These badges were first issued in May 1927. In 1933, the Bureau’s title was changed to the Division of Investigation. That same year, a conference of Special Agents in Charge was held in Washington, and they voted unanimously to retain the same style badge but to increase its size and have it cast with a slight curvature. The badges modeled in this fashion were first issued in April 1934, but they were in use for less than two years. 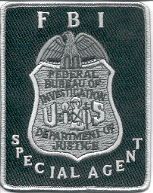 The Federal Bureau of Investigation was officially designated in 1935, and in July of that year, Special Agents throughout the Bureau exchanged their badges for the new issue. The original FBI badges were numbered from 1 to 1000. Many of these badges are still in use today. Notes: Version 1 has a cloth backing. Version 2 and 3 were made by Gman Emblem. One Gman version has a cut-out eagle at the top. Another Gman version with Velcro back. Notes: Very old and made on a white felt background. Possibly cut out from an armband in use in the same era. Notes: Made of leather. Used as a coaster. Notes: Very old. Made on a loom in use before computer digitized patches were made. Notes: Variations are due to color differences only. Notes: Three variations have cloth backings and the lettering is black on one, brown on one and tan on the other. The other four variations have plastic backings. One has black lettering, one has tan lettering, one is black subdued, and the last one is green subdued. There are also velcro variations of the black lettering one, tan lettering one and a new OD green one. Notes: Two color variations and two subdued variations. One of each has a cloth backing and the initials of the designer, Dave Kolberson. One of each also has a velcro backing. Notes: Color, Gray subdued and green subdued versions. Second gray version has differences in the eagle at the top. Another variation with a different size and eagle. All made by Gman Emblem. Notes: Fantasy Patch. Pawned off as being used by San Juan, Puerto Rico SWAT team, but it has been verified that this is untrue. Notes: Color and Subdued versions, one set has plastic backs and the other has velcro backs. Used by Tucson Resident Agency. Made by Gman Emblem. Notes: Raid Jacket patches made in 1995. One version is 3" and one is 4". Notes: Two have gold backgrounds and other has silver background. One gold version has notches near the wings. Notes: One gray version and one green version. Made by Gman Emblem. Notes: Color, Subdued OD, Subdued Brown and Subdued Tan Versions. All have Velcro variations. I also have plastic backed versions of the color and tan variations. All made by Gman Emblem. Notes: One color and one subdued. Made by Gman Emblem. Made of PVC with velcro backings.